คำขวัญ: "Concilio Et Labore" "ด้วยปัญญาและอุตสาหะ"
ตู้ไปรษณีย์ที่รอดจากเหตุการณ์ระเบิด บนตู้มีแผ่นป้ายเขียนว่า "ตู้ไปรษณีย์นี้แทบไม่ได้รับความเสียหายในวันที่ 15 มิถุนายน 1996 เมื่อบริเวณนี้ถูกระเบิดทำลายอย่างหนัก ตู้นี้ถูกนำออกระหว่างการฟื้นฟูใจกลางเมือง และนำมาตั้งไว้ที่เดิมเมื่อวันที่ 22 พฤศจิกายน 1999"
↑ Oxford Dictionaries. "Manchester". Oxford University Press, 2013. Accessed 27 August 2013. ↑ "UK population estimates". Office for National Statistics. 26 June 2014. สืบค้นเมื่อ 9 August 2014. ↑ "2011 Census – Built-up areas". ONS. สืบค้นเมื่อ 1 July 2013. 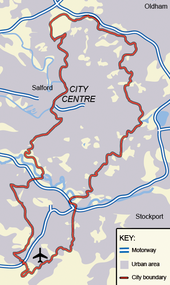 ↑ The first to be included, Wythenshawe, was added to the city in 1931. • "Manchester – the first industrial city". Entry on Sciencemuseum website. Archived from the original on 2012-03-09. สืบค้นเมื่อ 17 March 2012. ↑ "The World According to GaWC 2012". Globalization and World Cities Research Network. สืบค้นเมื่อ 25 March 2014. ↑ "BBC NEWS – London visited by 50% of UK's tourists". British Broadcasting Corporation. สืบค้นเมื่อ 21 May 2013. ↑ "Manchester 'England's second city'", BBC, 12 กันยายน ค.ศ. 2002, เรียกดู 2 พฤษภาคม ค.ศ. 2006. ↑ "Manchester 'close to second city'", BBC, 29 กันยายน ค.ศ. 2005, เรียกดู 2 พฤษภาคม ค.ศ. 2006. ↑ Mills, A.D. (2003). A Dictionary of British Place-Names. Oxford: Oxford University Press. ISBN 0-19-852758-6. สืบค้นเมื่อ 7 November 2013. ↑ 13.0 13.1 13.2 13.3 Hartwell, Clare (2001). Pevsner Architectural Guides: Manchester. London, England: Penguin Books. pp. 11–17, 155, 256, 267–268. ISBN 0140711317. ↑ Rogers, Nicholas (2003). Halloween: from Pagan Ritual to Party Night. Oxford University Press. p. 18. ISBN 0195168968. ↑ 15.00 15.01 15.02 15.03 15.04 15.05 15.06 15.07 15.08 15.09 15.10 Kidd, Alan (2006). Manchester: A History. Lancaster, Lancashire: Carnegie Publishing Ltd. pp. 12, 15–24, 224. ISBN 1859361285. ↑ Pevsner, Nikolaus (1969). Lancashire, The Industrial and Commercial South. London, England: Penguin Books Ltd. pp. Pg. 265. ISBN 0-14-071036-1. ↑ 17.0 17.1 Hylton, Stuart (2003). A History of Manchester. Phillimore & Co Ltd. pp. Pg. 1–10, 22, 25, 42, 63–67, 69. ISBN 1860772404. ↑ 19.0 19.1 Hall, Peter (1998). "The first industrial city: Manchester 1760-1830". Cities in Civilization. London: Weidenfeld & Nicolson. ISBN 0-297-84219-6. ↑ "Events in Telecommunications History". BT Archives. 1878. สืบค้นเมื่อ 2007-07-30. ↑ "The Manchester Coalfields" (PDF). Museum of Science and Industry in Manchester. 2001. Archived from the original (PDF) on 27 March 2009. สืบค้นเมื่อ 5 May 2009. ↑ "Manchester 1981-2010 Averages". Met Office. สืบค้นเมื่อ 30 January 2016. ↑ "Manchester Ringway 1961-1990". NOAA. สืบค้นเมื่อ 30 January 2016. ↑ "Manchester ringway extreme values". KNMI. สืบค้นเมื่อ 30 January 2016. ↑ United Kingdom Census 2001 (2001). "Manchester (Local Authority)". neighbourhood.statistics.gov.uk. สืบค้นเมื่อ 2007-07-10. ↑ 36.0 36.1 "Manchester profile of 2001 census". Office for National Statistics. 2003. สืบค้นเมื่อ 2006-10-25. ↑ "Mid-year estimates for 2006" (XLS). Office of National Statistics. 2007. สืบค้นเมื่อ 2007-09-13. ↑ "Football fever". Visit Manchester web pages. Visit Manchester. สืบค้นเมื่อ 6 October 2008. • "Sporting heritage". Visit Manchester web pages. Visit Manchester. สืบค้นเมื่อ 6 October 2008. หน้านี้แก้ไขล่าสุดเมื่อวันที่ 29 ธันวาคม 2560 เวลา 09:16 น.